This year I've loved buying for my boys, I really have. Especially Noah who is four, he's at an age were he definitely has his 'style' of toy, he loves construction, tractors and vehicles but he really enjoys puzzles too and learning games. Four is a wonderful age because he really appreciates the things he opens, you get the wow factor and the excitement as they unwrap the paper. It's my favourite age so far and I can't wait for him to see what he has for Christmas this year. 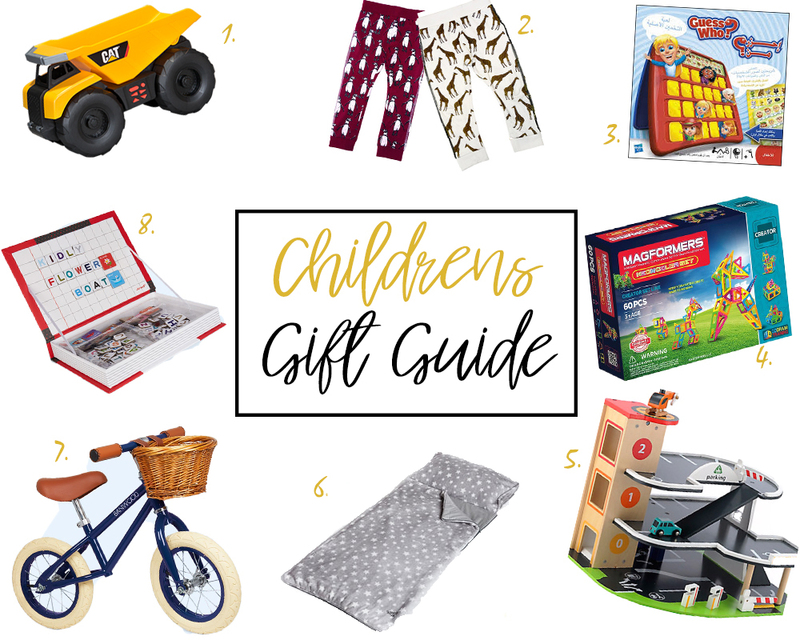 Children are definitely amongst the easiest to buy for, so I'm sharing what I think will make fantastic presents this year. 2. Lamb & Bear leggings - We LOVE Lamb and Bear, Noah is four now and at the age when a lot of cute leggings stop stocking his size, it's frustrating as I think leggings are so comfortable for boys. Especially for nursery and days when they're going to be quite active, I really don't like shoving him in jeans. Lamb and Bear do amazing prints, and their size range is great meaning you can twin your children if you're as lame as me. They wash so well and I always get compliments when the boys are sporting theirs. 3. Guess Who - A classic I'm sure you'll agree, and though it seems to have a much higher age recommendation, it's great for younger children. It helps them with their understanding of the world, and personal, social and emotional development, (nursery nurse here!) and is an all round fun game. Noah loves playing it after receiving this from Uncle Jake, it took a few goes to get the hang of what kind of questions to ask but it's lots of fun. 4. Magformers - I'm warning you that if you buy Magformers for your child, you will get territorial and want to use them all for yourself. We love Magformers in this house, they're so much fun and John definitely gets way to into it. They're fab because their pieces aren't really tiny, so we don't have to worry about them getting lost or ending up in a certain toddlers mouth. They're easy to use and help with fine motor skills. 5. Wooden garage - This may or may not be under the tree for Noah this year. We've bought a ridiculous amount of plastic toy garages over the years, and I have to be honest in saying they have been rubbish. It's definitely worth investing in something wooden as you know it's going to last that bit better. I know both boys will love this but Noah especially, he no longer has to use the sideboard to run his cars along. 6. Snuggle Sac - If your little one is anything like mine, then the thought of making dens or camping is top of their list. Snuggle sac's are great for both of these, we have one for Noah that he loves to use and camp out in under his cabin bed, we set up fairy lights and he thinks it's so magical. They're also amazing if you travel a lot like us, even if it's not for camping, you don't have to worry about clean bedding if you've got a snuggle sac in the boot of your car. I can verify, they're incredibly cosy and comfortable. 7. A Bike - Another present that may or may not arrive on Christmas day, though ours isn't quite as chic as this as we've opted for a 'proper' bike with stabilisers. This balance bike is beautiful and a really good investment for a younger child, I've heard amazing things about balance bikes and how much it helps children later on. This Kidly version is just absolutely beautiful. 8. Word board - Last but not least is this word whiteboard, if your little one is at school age, they might be really into spelling and letters at the moment, this is a nice fun way to incorporate it at home. It also folds away all together so you don't have to worry about little pieces ending up under the sofa or lost. This is the only resource I need to nab the perfect gift for all the child on my list. Thanks for sharing.